You have landed on the page with the latest Texas Roadhouse menu prices. Texas Roadhouse is a Western-themed restaurant best known for serving their legendary USDA prime steaks and other American classics such as ribs, chicken, burgers & sandwiches, fish, and country favorites. All dishes are made from scratch using the finest ingredients. You will never leave Texas Roadhouse feeling hungry as they offer large portions. Be sure to try their award-winning Texas Roadhouse ribs and chili. Don’t forget a cold beverage with your meal. Texas Roadhouse has an extensive list of ice-cold beverages including beers, margaritas, and specialty cocktails. Below are the latest Texas Roadhouse menu prices. What’s New at Texas Roadhouse? The best way to know about the latest news, new menu items, or Artist of the Month is to read the Texas Roadhouse blog or Press Releases. You get a wealth of information from DIY suggestions to cooking tips. Texas Roadhouse offers a ‘gluten-friendly’ menu alternative for those with gluten sensitivities. Check the menu online or at the restaurant to ensure that you will not have any issues. For guests counting calories, each menu item includes a total calorie amount. Texas Roadhouse locations are open for dinner only 7 days a week. On weekends, some locations may be open for lunch. Texas Roadhouse hours of operation vary by location. Please be sure to check with your local restaurant. Texas Roadhouse restaurants support local charitable organizations, schools, and fundraisers. Team members are encouraged to help out and volunteer in their communities. Texas Roadhouse is a supporter of Habitat for Humanity. Everybody loves free food! Join the Texas Roadhouse email club and you will start receiving special offers and discounts right in your mailbox. All it takes is a few minutes to sign up online. Admit it. you can line dance with the best of them. Why not turn your passion and enthusiasm into a career at Texas Roadhouse and become an official ‘Roadie’. Check out the Career page on the official Texas Roadhouse website to learn more about current opportunities. Read stories from current employees on why they love their job! Learn how ‘Roadies’ support each other and their local communities. Sometimes you just need a little inspiration to find that perfect gift. How about a Texas Roadhouse gift card? You can design your own card or choose from standard designs. Do you need a last minute gift? Send an electronic gift card and have it delivered to the recipient’s email inbox within hours. That’s fast! Planning a special night out or dining with a big group? Nobody wants to wait to be seated. Texas Roadhouse allows you to call ahead and put your name on the list. Arrive at the specified time and Voila! you get seated. It’s like you are an insider. Good job. This is not a reservation and you should check with your local Texas Roadhouse location to see if this service is available. Now you can share the flavors of Texas Roadhouse with friends and family. You can purchase their famous steak sauce & seasoning or their rib seasoning. Be the star of the cookout and don’t tell anyone where you got the rib seasoning. Kent Taylor’s dream was to open a different type of restaurant. A place where guests could go and have a wonderful meal and a good time. No doubt the food had to be top quality as well. On February 17, 1993, Kent did just that and by the late 1990s, the restaurant expanded rapidly. Today, Texas Roadhouse is the place to go for good food and fun. From buckets of free peanuts, jukeboxes and line dancing servers, there is never a dull moment at the Texas Roadhouse. Texas Roadhouse is a publicly traded company headquartered in Louisville, KY and boasts over 460 locations in the U.S. and parts of the world. Keeping up to date on all things Texas Roadhouse is easy. You can follow or connect with Texas Roadhouse through various social media platforms. 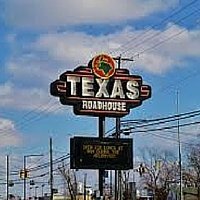 Interested in reading more about Texas Roadhouse? Visit their official website. Love to go to Texas Roadhouse, my daughters both are steak lovers. Fourteen of our friends going to dinner tonight to celebrate Charlie’s Birthday. Should be fun. My friend and I eat there at least every two weeks. We are both seniors and love the food. Our biggest complaint is we are so miserable when we leave. The food is excellent and always cooked to order. Keep up the good work. Your salads are the best in this city along with your steaks. I love the big meaty steaks. Also I love big cowboys who fix my food for me with their rough hands. I am goint to Bangor Maine & because of diabetes & kidney problems am on a very restricted diet, no salt or sugar. I would like to visit your restaurant & wonder do you have a special menu for people with health problems or could you prepare a special meal for me with reduced salt & sugar? What comes with the entrees? Where are the beer prices??????????????????????????????????????? Food is always excellent, but the price of a glass of wine is terribly high. Also the glass is so small. There may be 6 oz in the glass, but that is a stretch. I llllloooooovvvveeee this place…best steaks in laffeyette!! !also excellent service…and free peanuts. I really like everything you have but wish you had a combo with shrimp and ribs or a combo with catfish and schrimp, but other then that it’s my favorite place to eat. Really good food but there have been 4 or 5 times I’ve ordered 1/2 oven roasted chicken only to find out that they were out. Not good to have a menu item that you run out of so often. I have only been to the Augusta Maine Texas Roadhouse in the last 2 years but have been to at least 5 different stores before.